A generously proportioned piece, this open salt has a top diameter of 2 7/16", stands 1 5/8" tall, and weighs a robust 2.7 T. oz. Exceptionally quality, it has three, cast and applied, pad feet, with raised anthemions where they join the body. The splayed rim has a repeating leaf and bead design, while the interior is finished in a bright gold wash.
Of a form that is decidedly exceptional, and to a grand scale, this fork measures 9 3/8" long and weighs 2.5 T. oz. The pattern is "Armor," issued by Whiting Manufacturing Company in 1871. It incorporates acanthus leaf elements, an area of scaling that is perhaps intended to evoke chain mail, and other details that are Gothic Revival in style. The serving end is what defines this likely vegetable fork, and it is commanding. Price per piece, five available. 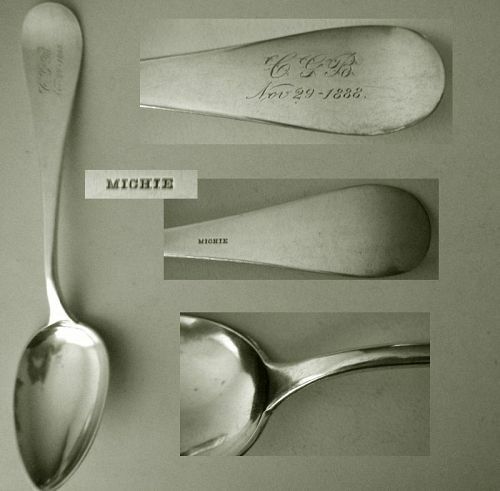 A well known name among mid 19th century, Boston silversmiths, "Lincoln & Foss" offered quality, mainstream, goods. This 5 1/2" long, relatively heavy at .9 T. oz., egg spoon is such an example. It is a "Bead" pattern, with the design appearing on both sides of the handle. The reverse has a fancy script "CBD" monogram. The oval bowl is generously sized at 1 3/4" long and 1" across at the widest. It retains an original, bright gold wash front and back surfaces. Measuring 7 7/8" long and weighing just over 3.2 T. oz., this pair of tongs are large enough in relative terms to be described as immense. They may be an old implement that is sometimes referenced as (fried) chicken tongs. They are stamped "Lincoln & Foss" for the mid 19th century (1848-57) Boston firm, and quite unusual for the date, "Sterling," rather than the expected coin silver. Measuring 6 1/2" in diameter and having a 3/4" wide, raised edge with a rim back, this plate is weighty at 5.2 T. oz. It is stamped "Lincoln & Reed" for the Boston firm with dates 1838-48, and "Pure Silver Coin," which is a term typically used only in New England. 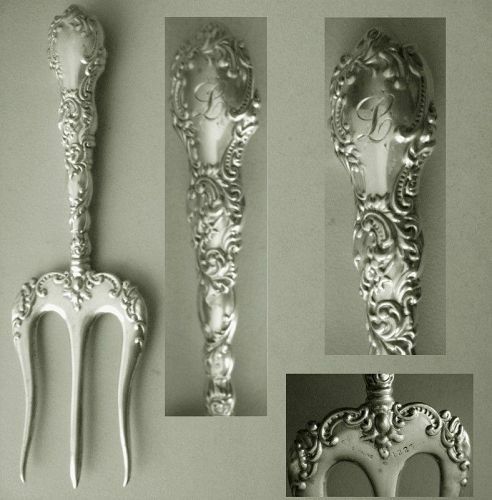 Frequently found as a presentation or commemorative item, this flat blade form of a trowel pie server lends itself to an inscription. This 11 1/4" long example has an engraved margin, but is otherwise plain and without any erasures. Produced the last year of the reign of Queen Victoria, this knife rest measures 3 1/4" long, stands on two, four-spoke, arms that are 1 5/8" in diameter, and weighs a substantial 1.5 T. oz. It is fully marked for Sheffield, sterling silver, a date letter "h" for 1900-01, and the maker's "RM over EH" in a diamond. It is Georgian in style, having a center bar with turned ends and a hexagonal middle section. The resting legs have double ball tips. An impressive piece of relatively early Irish silver, this gravy ladle measures 7 1/2" long and weighs approximately 1.5 T. oz. Dating from the George III period, it is fully and clearly hallmarked for Dublin, 1777, sterling, and maker Michael Homer, whose dates are appropriate to this. 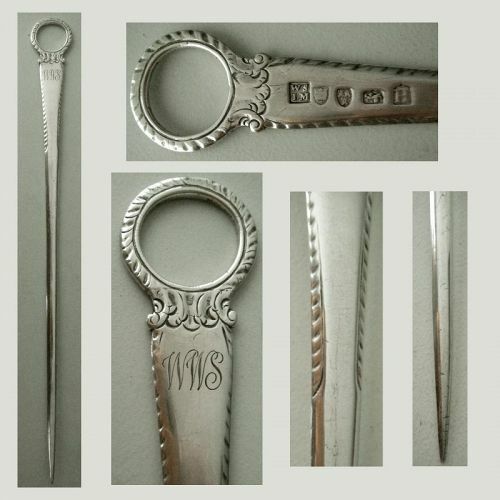 It has a "Hanoverian" style handle, with a down turned, reverse tipt handle that is extensively engraved in bright cut and wriggle work on the front. The marks on this 3 1/8" top diameter, 1 1/8" high, bowl standing on a 2" wide rim base and weighing a relatively heavy 2.9 T. oz., beg identification, although the quality of work bespeaks a skilled producer. They are "MKH" and "JAH" in block lettering, "Hand Wrought," and "Sterling." The piece is compellingly appealing in its simplicity of design, good heft, and the high quality of its workmanship. Measuring precisely 12" long and weighing 2.2 T. oz., this meat skewer is nearly 250 years old. 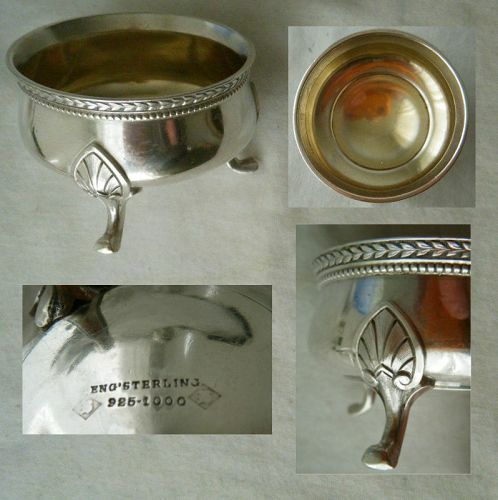 It is fully hallmarked for Newcastle, England, 1774-75, sterling silver, and makers William Stalker & John Mitchison. Typical of the form, it has a tapered shank that goes from 3/8" wide to a pointed tip. This has beveled edges, with feathering on the upper portions front and back. This is also the place where the marks are located on one side and a "WWS" monogram on the other.